He developed his research career in electrochemistry and chemical sensors at the UK Atomic Energy Research Establishment, Harwell, in the 1980s. He became Thomas Graham Professor of Chemistry at University College London in 1991 and co-founded Capteur Sensors Ltd. He was Head of the Chemistry Dept at UCL from 1999-2002 and co-founded Aeroqual Ltd (www.aeroqual.com). He was Chief Scientist of Inverness Medical Innovations ( www.invernessmedical.com/ ), based at Unipath Ltd, Bedford, UK, from 2002-2005. He joined the faculty of the Chemistry Dept at The University of Auckland in February 2006. Mote Ltd (air quality data systems) Orbis Diagnostics (centrifugal microfluidics in the cowshed)and SpotCheck Technologies (DNA sensors) are recent startups. 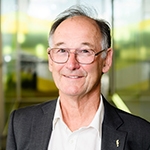 He is a Principal Investigator and former Deputy Director of the MacDiarmid Institute for Advanced Materials and Nanotechnology, and Associate Investigator of the Maurice Wilkins Centre for Biodiscovery and of the Centre for Medical Device Technology. He was an Adjunct Professor at Dublin City University where he was a Principal Investigator in the Science Foundation Ireland-funded Biomedical Diagnostics Institute. He is a Visiting Professor at University of Queensland and at University College London, where he has strong research links, and has been Visiting Professor at University of Southampton, University of Toronto and Cranfield University of Technology and Honorary Visiting Professor of the Royal Institution of Great Britain. He has published around 270 papers in international journals, and is inventor on around 50 patents.